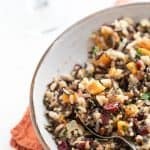 When I think of fall, I think of this Baked Butternut Squash and Wild Rice Pilaf – one of my favorite baked butternut squash recipes. Earthy, sweet and a little tart, it is the perfect side dish for roast turkey, pork or chicken… or as a vegetarian main dish, or for lunch the next day! Now, since I believe in full disclosure, I am going to tell you that this wild rice pilaf is a little bit of work… but the payoffs are worth it!! The most daunting part of this baked butternut squash recipe for most people is cutting the butternut squash! So since I get asked this question a lot, I’ve got a little tutorial for you! Peel the butternut squash! A good peeler is essential! I like the OXO peelers for this but any good, sturdy peeler will do. Cut the squash in half lengthwise and use a spoon to scoop out the seeds. As for cubing the squash, I like to cut it lengthwise into 3 sections and then cut each section into cubes. 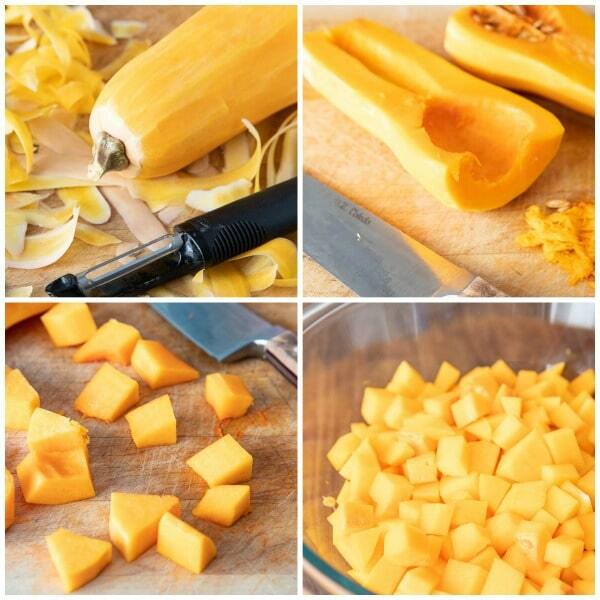 Now that the squash is cut, the next question is…how long does it take to make these baked butternut squash cubes? For butternut squash cubes that are about 1 inch in size, you need to bake them about 25 minutes at 400 degrees. The larger your cubes, the longer the cooking time. I generally set my timer for 40 minutes for larger chunks and then check the cubes with a fork. If you are baking just the halves, or even the bottoms you need to cook the squash for approximately 1 hour at 400 degrees. If you like less browning on your squash, you can reduce the heat to 375 degrees -and increase your cooking time to 1 1/2 hours. Step #1: Cut the butternut squash as detailed above. Spread the butternut squash cubes on a sheet pan that you’ve sprayed with cooking spray. Drizzle with olive oil and toss. Bake in the oven until the butternut squash is tender and lightly browned. While the squash is cooking, saute the onions and cook the wild rice mix according to the package directions. Then add everything to a large bowl! 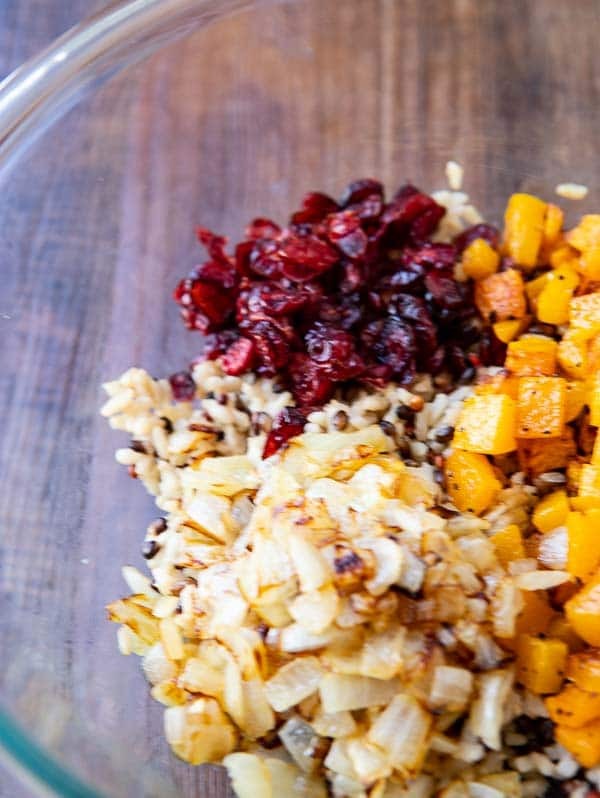 Step #2: Mix the dressing up and then drizzle it over the wild rice, baked butternut squash cubes, toasted pecans and cranberries and toss to coat. Taste and adjust seasonings. Then pour this wild rice pilaf into a large bowl and serve! This Baked Butternut Squash and Wild Rice Pilaf not only tastes delicious but is very versatile. Put the extras (if you are smart enough to make extra and I’m telling you now, DO IT!) in the refrigerator for a great wild rice pilaf salad for lunch the next day. Speaking of which… if you’re thinking of making this for the holidays, great choice! You can make everything ahead of time. Just mix everything together before serving!! So, the bit of time you invest making this will pay off during the week… leaving you more time to enjoy the fall colors or snuggle up in a sweater with a good book (hey, a girl can dream, can’t she??)! If you enjoyed this recipe, I would love for you to leave me a comment and a rating! 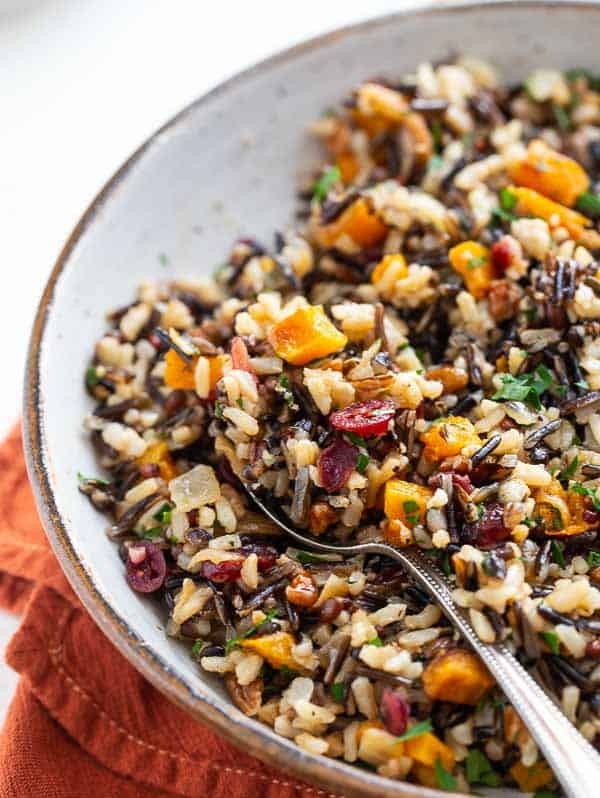 When I think of fall, I think of this Butternut Squash, Cranberry and Wild Rice Pilaf. Earthy, sweet and a little tart, it is the perfect side dish for roast turkey, pork or chicken... or as a vegetarian main dish, or for lunch the next day! Pre heat the oven to 400 degrees. Spray a sheet pan with cooking spray. Add the butternut squash and toss with 1 Tbsp. canola oil. Roast squash for 20 - 25 minutes or until softened and slightly caramelized. While squash is roasting, combine the stock and rice in a large saucepan. Cover and bring mixture to a boil. Reduce heat to a simmer and simmer for 20 - 30 minutes until the liquid is absorbed and the rice is tender. While rice is cooking, heat a large saute pan over medium high heat. Add the 2 Tbsp. of canola oil. Add the chopped onions and saute for about 6 minutes until translucent. Reduce heat and continue to cook onions until slightly caramelized. Remove onions from the pan and set aside. Add pecans to saute pan and cook over medium heat, until toasted - watch closely so they don't burn!. Add the cooked rice, butternut squash, onions and dried cranberries. Drizzle with 1/4 cup of the citrus dressing. Stir. Taste and adjust seasonings, adding more dressing if needed. Garnish with minced parsley if desired. Serve! Combine all the ingredients except the olive oil in a small bowl. Slowly whisk in the olive oil. Signup today for my weekly newsletter for the latest recipes, tips and tricks and receive my FREE Party Planning Guide! 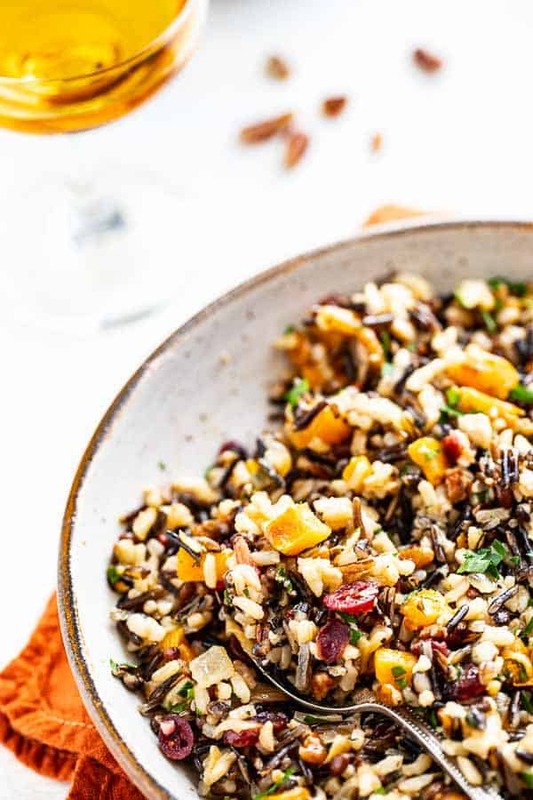 This looks like the perfect dish for today… and you say it’s a lot of work – but it’s not – a roasted squash and some wild rice and a sauté pan! Bon appetite! Thanks Lucy!! You are right – it really isn’t but it does look that way.. totally pays off though if you get a couple of meals out of it!! wow – it really is fall; cranberries and butternut squash. It doesn’t get more “harvesty” than that. I love the idea of incorporating it into your rice – something I need to keep in the back of my food brain! Looks delish – Nancy. And how ironic – it rained today! I know!! I love adding veggies/fruit to grain dishes – another great way to incorporate more fruits and veggies into the diet – love how they lighten the grains!!! I would love a plate of this pilaf right now! Wish I had some left… but it was lunch a couple of days ago!! Delicious! I could honestly eat that for an entire meal! I have a confession to make… I have!!! Thanks for stopping by the Table! SO about this rain today. It’s sent both my husband and I in a tail spin. We both want to sit on the couch drinking hot chocolate eating junk food watching movies. This rice pilaf would be a much better choice, that’s for dang sure! It looks fab! Oh, how colorful! And you have some of my favorite flavors in this pilaf. I do something similar to this for Thanksgiving stuffing so I’m sure I’d be a fan of your recipe as well. OOh…. hope you’ll share your stuffing on your blog!!! I love this dish, it yells “fall!” The color is perfect. Nancy the kids and I were celebrating this morning as we loved the hint of fall that the rain brought in 🙂 This pilaf sounds wonderful. Love the sweet/savory flavor combo. I was celebrating too! :-)!! It doesn’t feel at all like fall here, but we do have butternut squash at the farmers’ market. I love this mix of flavors and textures. This is a beautiful dish for fall! what a great day right? rainy and cool… i like the wild rice mix from traders- yum! I truly LOVE the rain!!! Trader’s mix is a good one and I love the one from Sprouts too! I could mix the candy stripe yellow and chartreuse figs I got at the farmers’ market Sunday with your glorious creation, and we’d have all the colors of the seasons covered! CANDY STRIPE FIGS??? I have GOT to get my hands on some of those pronto!! They would be fantastic in this!! Ha! I’m laughing b/c I got all excited when we got like 3 drops of rain these past few days. 😀 I have to say, I’m ready for a little bit of fall weather. Me too Sylvie!! It’s raining right now and I am wishing I didn’t have to go out -would love to just stay home and bake!! I love the fall flavors in this pilaf. The weather totally affects my cooking mood, and I am LOVING this weather right now. Me too Esi – I feel that way every year! I wish it were my napkin because that means I would have been at your house!! It’s been WAY too long since I’ve seen you!! What a lovely, colorful side dish! Thanks Judy – have to admit, I’d have made it for the colors alone… fortunately it tastes as good as it looks! What a colorful and flavorful dish, Nancy. I’m always willing to spend a little extra time on a dish if it means that it’s going to taste great. If it stretches across a couple of meals, that’s even better. By the way, I think your photos are more and more beautiful every time I visit. Thank you so much Dara!!! Working with Todd and Diane is rubbing off on me… learning by osmosis!! Gorgeous photos. And thanks for the hardwork head’s up. I’ll save this one for a special occasion! Thanks Brooke! It takes a bit of time but it’s worth it! The weather has gotten chilly and rainy here so this pilaf looks perfect! Love everything about it! Hi Mj! I love chlly, rainy weather and I agree – this is just the kind of dish I love when the weather is cold and damp!! Nancy, your rice dish looks like it would make a wonderful for stuffing for chicken or turkey breast. Pretty and perfect for fall. Thanks you! Thanks – I think it would be a terrific stuffing as well!! Especially for those who have trouble with gluten! Love your photo with the color-coordinated napkin. This sounds delicious with the dried cranberries and pecans. Just my kind of dish. Thanks! I am having so much fun with my photography – and this dish is really good!!! It’s raining here in NYC today also and think it is perfect pilaf weather! Especially when butternut squash is in the picture. I think so too!! I love potatoes but sometimes it’s dishes like this that I crave the most on cold and dreary days! I love butternut squash (ok, let’s be honest here, I love ALL squashes!!). Thanks so much for stopping by!! The beautiful picture of your dish brought me to your site. Very pretty! I also like the recipe of the pilaf. Thanks! So glad that you stopped by and that you liked the photo and the recipe!! I am so happy that you enjoyed it!!! Sounds like a great combination of flavors. I’ve started cooking with butternut squash a lot more recently and am always looking for different recipe to incorporate it into. Have never made wild rice though — am curious to see how it tastes! You are in for a treat! Wild rice has a wonderful nutty flavor and a slightly chewy texture… darn, now I want some:-)!!! Hello Megan! Thank you so much for letting me know! The recipe is now right back where it belongs!!! Enjoy!!! HI! I'm Nancy, a food obsessed cook here to tempt your tastebuds and help you explore the world of food through easy, ethnic recipes. Discover must have ingredients and useful cooking techniques... one dish at a time! Care to know more? STAY UPDATED WITH A COMMUNAL TABLE! The Most Popular Recipes on ACT!